On the evening of his 80th birthday, Pope Benedict was treated to a concert by the Radio-Television Orchestra of Stuttgart, held in the Paul VI Audience Hall. Featuring pieces by Dvorak and the pontiff's beloved Mozart, the orchestra was helmed by Gustavo Dudamel, the 26 year-old Venezuelan conductor recently tapped to take the reins of the Los Angeles Philharmonic in the 2009 season. The American violinist Hilary Hahn, 27, an alumna of Philadelphia's Curtis Institute of Music, was the evening's featured soloist. In his concert-ending remarks, the Pope -- who dined earlier in the day with the members of the College of Cardinals present in Rome -- thanked the musicians for the "gift of having elevated our souls" through their performance. "I'm convinced," Benedict said, "that music... is truly the universal language of beauty, able to unite people of good will across the earth, bringing them to raise their eyes Above, to open them to that which is absolutely Good and Beautiful." A pianist in his spare time, the pontiff thanked God for allowing music to serve in his life "as something of a companion on the journey, always offering me comfort and joy." He also thanked the people who, from his first days to the present, "have brought me closer to this spring of inspiration and serenity." Pope Benedict received a customary gift for a Pontiff on his 80th birthday on Monday -- a concert of classical music -- as well as a more unusual offering -- a huge stuffed toy bear. 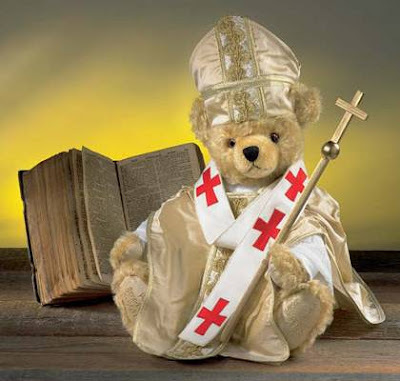 The Pope's secretary, Monsignor Georg Ganswein, told Vatican Radio that the bear, which he called "a beautiful specimen," was sent by an unidentified Italian. The Pope sent it on to Rome's Bambino Gesu (Baby Jesus) children's hospital and received a letter of thanks from the young patients there. ...whether the gift was a depiction of the Birthday Boy similar to the one below is anyone's guess.